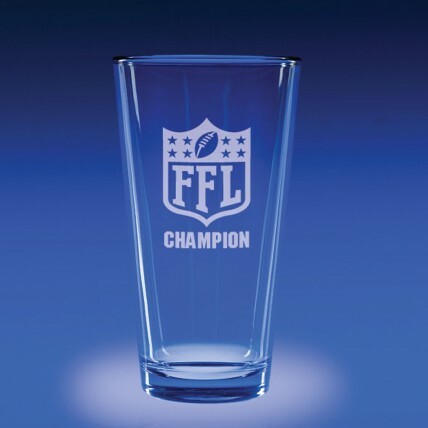 Give your league's winner fantasy football gifts that they will use every day, an engraved set of 4 FFL Champion Pint Beer Glasses! With a classic pub shape, each pint beer glass features clear, sparkling glass, engraved with your league's logo or winner's name for free in frosted letters. Each glass holds 16 oz of your favorite brew; size is 5.75" tall x 3" wide. Price includes set of 4 glasses. Makes a great commissioner's gift!